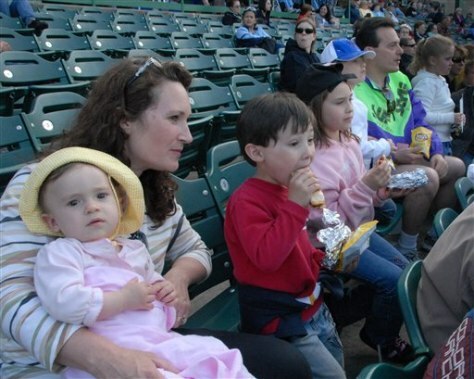 Gemi Nardini, 4, red shirt, works on his hot dog during a BlueClaws minor league baseball game in Lakewood, N.J., as mom Kiersten, left, holds his sister Talianna. To Gemi's right are sisters Elliana and Gianna, and dad Alan. Kids eat free at the games as part of a season-long promotion to encourage families to go to the games.